Although, feel free to buy from createspace as well (see below), which is better for our meager finances. Vol. 4 No. 1 is now available in a fancy format. A fancy format for a fancy fox. 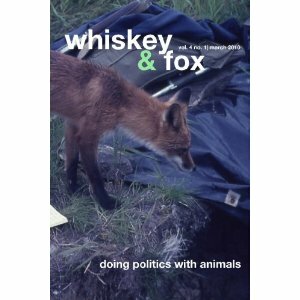 The schnazzy gloss cover features a very respectable looking fox nosing around the camp of an archaeologist in Alaska. No kidding. For now, it's available for purchase here. And will be available within 10 or so days from Amazon. Check back here for that link, which we'll post as soon as it's available. ...apprendre à vivre avec les fantômes, dans l'entretien, la compagnie ou le compagnonnage, dans le commerce sans commerce des fantômes. À vivre aurtrement, et mieux. Non pas mieux, plus justement. Mais avec eux. ...to learn to live with ghosts, in the upkeep, the conversation, the company, or the companionship, in the commerce without commerce of ghosts. To live otherwise, and better. No, not better, but more justly. But with them.